I don't think it is right. The HP 2710p has 256 levels of pressure. Btw, I imputed those figures and now I have basic function. No sensitivity, but it does jump around and move, not like a mouse. I installed the Intuos 2 drivers so I could get sensitive. It was very spotty. Full pressure would result in thinner lines than medium pressure, light pressure would cut out, just all around not normal. I reloaded the Waxbee Config program and changed the sensitivity from 170 to 256 and now it works as it should. I guess it is time to order that LVDS controller kit. So once I get the LCD set up, how do I go about calibrating the digitizer to the LCD? I tried running the Tablet PC configuration included in windows, even though I can't calibrate it to the tablet's LCD I figured it would allow me to configure it to my desktop monitor, but no go. Is there a way to use Waxbee to make the digitizer work with Wacom's Tablet PC – Enhanced Tablet Driver? From the pictures of the underside of the digitizer board you can clearly see the vcc and ground traces where they've popped through the boards with vias, so definately pin 14 ground and pin 13 Vcc. And from your recent success i think that you may have made a mistake with your assessment of the wire assignment may have been shifted by 1, ie wire13 was actually wire14, this would give a short though ground causing wire13 (as you originally have it) to get very hot. I agree with the assessment of the rest of the pins on your pinout on the socket but then you already know you have that right as you almost have it working. This is great by the way, and moving on swiftly! Whoa! Scratch that, there was a whole other page i missed, SUCCESS!!! Well done, good work! Is there a way to use Waxbee to make the digitizer work with Wacom's Tablet PC – Enhanced Tablet Driver? I think this should just work as waxbee is emulating an intuos2, as far as the computer is concerned this is what is connected, calibration is just done by altering the algorithm in the software. Do you have the latest driver package from Wacom that supports the intuos2? I have an intuos2 and I'm running version 6.1.7-3 of the driver all working correctly, maybe this one will work for you? No, Waxbee does not support emulating a tabletpc penenabled USB digitizer and enable the "visual" calibration utilities. Would be a great fit for ISDV4 and a lot of builds that does not need intuos2 advanced features. This would require some work to add this a new emulation target. Another option is to emulate a Cintiq. 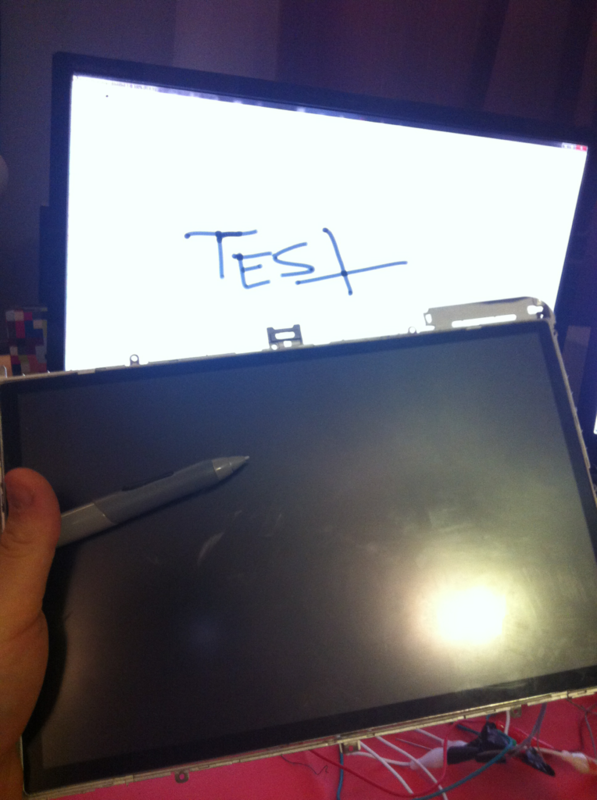 For now you have a shiny new Intuos2. To precisely calibrate your Intuos2 you need to enter numbers in the driver (trial and error). Pressure: enter 255 instead of 256. It has 256 levels: from 0 to 255. It is "capped" internally. It works but it is not as accurate. When you plan your case make sure you have some access to the teensy button or at least another external button wired to the RST + GND pins. This will be useful for future Waxbee upgrades without opening your case. Ok so I'm confused then, I thought that the waxbee code on a teensy was designed to output the HID info to the computer using the original serial com and converting this for use with usb, so does this not then present itself to the computer as a Wacom device? ThrowingChicken says that the Intuos2 driver was then installed but didn't initially work correctly as the pressure settings were wrong in the waxbee config, these settings were then amended and the pressure sensitivity is now working, which suggests to me that the TabletPC penenabled digitizer is acting as an Intuos or Cintiq device otherwise the driver (which probably supports I2 to I4 and Cintiqs WX/SX/UX/HD) would not work. Also, doesn't the visual calibration just take the HID information and set limits based on relative pen position? There is no interaction with the tablet in order to set which regions are active on the digitizer, this is all done in software I'm sure. Perhaps you are saying that there is some code required to initialize the software to allow calibration, and perhaps based on device ID? So if this doesn't exist already couldn't you just present the TabletPC digitizer as an Intuos or Cintiq using a device specific ID? Pardon me if I'm being stupid, I have never tried to convert a serial device to usb and nor do I plan to, but I thought I understood the process fully, perhaps I do not. I would be interested to know how the driver picks up the waxbee though. You might be right. I wanted to check for where the wires were going but unfortunately my prying open of the connector was a little more violent than expected and I ended up pulling all of the wires out before getting a chance to see where exactly they went. That said, I am still pretty certain I'd have needed to replace those wires. I have that extra cable where I snipped the line [I presumed was going] to pin 13, when I hook the continuity test to it I get readings on both pin 14 and 13. I don't know what it is about this cable, or how it was ever able to work with the laptop, but it loves to short out. The one I am using is 6.2.0w5. It gives me pressure sensitivity and all that good stuff; It basically works like an Intuos at this point. My concern is, once I have the LCD working, can I calibrate it so it all matches up? Aye, so it probably isn't as simple as changing a few numbers in the Waxbee Configuration Utility, is what you are saying. As someone who knows nothing about coding, but has access to a working tablet PC using the ISD driver; Is there anything I can do to help get that developed? As for the driver mod, would this be the hex file that Waxbee made or would it be the driver I installed from Wacom? If it has 256 why do I want to cap it at 255? It's only a levels difference so I doubt I'd notice, I am just curious. I know this isn't directed at me, but I'd have thought I could use the on screen tablet configuration to match the digitizer [seen as an Intuos 2] to the monitor, but when I click on the calibration cross hairs nothing happens. If only they worked together, it would make things much simpler, lol. On a side note, do you any of you think it would be possible to build a VGA, USB, and 12VDC 4A power supply to 25-pin d-sub cable adapter? The goal being to have a box desktop side where I'd plug in my power, USB, and VGA from the computer, then plug a single cable into the other side of that box, then have that cable plug into my tablet where inside would be another adapter converting the pins back to VGA/USB/Power, that way I don't have a bunch of wires coming out of the tablet. I am sure the wiring is no issue, but will this cause interference inside the cable, or data loss, and can a d-sub handle the power supply? This is because 256 degrees of pressure is made up from 0 through 255 = 256. I know this isn't directed at me, but I'd have thought I could use the on screen tablet configuration to match the digitizer [seen as an Intuos 2] to the monitor, but when I click on the calibration cross hairs nothing happens. Ah yes, that makes sense. Already updated, I don't know if it is real or perceived but I think it feels better. Ahh I see I think that the ISD Tablet PC Driver is doing all the work for you. There are two parts within the Wacom driver which you would set in order to match up the pen to the screen exactly, the first is 'Pen Mapping', the second is 'Tablet Mapping'. I have described 'Pen Mapping' below, but 'Tablet Mapping' is similar with the exception that the corner markers are not present. With both set up everything will match beautifully. If I click in the top left corner of the box and then the bottom right you can see in the next image that my active area has been adjusted to only work in the bounding box which is highlighted with a red rectangle around the mini picture of this very text box. So, in this example the whole of my Intuos 2 active area has been remapped to just the text box, ie I can move the pen anywhere on the tablet but it will only move the cursor around inside the text box selected. Yeah I guess that driver has spoiled me. I've gone ahead and ordered the LVSD controller kit, that will take a couple of weeks to get here. I've also ordered some other components to experiment with. Once I get a proof of concept for some features I want then I'll start planning out the case. Driver: Just alter the numbers to make a perfect match. Is your LVDS controller has the ability to be reprogrammed to another LCD panel?